Long-term studies of montane meadows in the greater Yellowstone ecosystem by researchers found that warmer temperature and drier conditions may affect the diversity of plants and animals in areas most vulnerable to climate and precipitation changes. Iowa State University researcher Diane Debinski conducted observational studies of the plant and insect communities in 55 montane meadows in the ecosystem, including six types of montane meadows that ranged from dry (xeric) to wet (hydric). 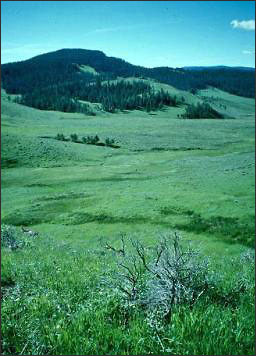 These meadows receive most of their water from winter snow melt, runoff which provides water into July and August. Debinski and researchers measured the changes in the plant community from 1997 to 2007, including a period of extended drought. They found that shrubs (such as sagebrush) that grow in the drier meadows increased, while flowering plants decreased in number. With deeper roots, most shrubs can obtain water from deeper in the soils. Flowering plants generally receive water from nearer the surface. Importantly, shrubs from drier meadows do not provide as much food for animals as flowering plants that grow in wetter meadows. Since there were fewer flowering plants in the drier years, pollinators such as butterflies were also becoming scarce in several of the plots studied. Two species of butterflies that live in the wetter meadows actually disappeared from sampling sites for a year, but were observed again in later years. The results showed that medium-moisture meadows — neither wet nor dry — are most vulnerable to changes in climate.